So, while we’re on the subject of American cultural exports, let’s consider Coca-Cola. Coca-Cola is certainly the most widely-recognized American export to the world: certainly more so than Ford, or Levis, or even McDonalds. Here in France, ordering “un Coca” is as commonplace as ordering “a Coke” back in the U.S., but there is a difference here—and I’m not just talking about slightly smaller cans and much higher prices—I’m talking about the taste. At least according to the Coca-Cola website, the recipe used in France today is essentially the same recipe used back in 1886: carbonated water, sugar, caramel color, phosphoric acid, natural flavors (including caffeine from kola nuts), and cocaine … wait, so, no more cocaine, but they do still include coca leaf extract in those natural flavors. So what could possibly explain the difference in taste between an American Coke and a French Coca? Well, it’s all about the sugar. In the United States, we started replacing sucrose (sugar from cane or beets) with high-fructose corn syrup in the early eighties. HFCS is a sweetener made from corn, in which some of the glucose from the grain is converted into fructose to achieve the desired sweetness. They don’t do that in France, though. Here, Coke is still sweetened with sucrose. Now, I’ll put aside the whole debate about the health effects of HFCS consumption. Suffice it to say that using sucrose instead produces a noticeably different, slightly sweeter and richer flavor. If you’re an American born before 1975 or so, you’re probably nodding your head in agreement, reminiscing about the good ol’ days when Coke from one of those little glass bottles just tasted better. 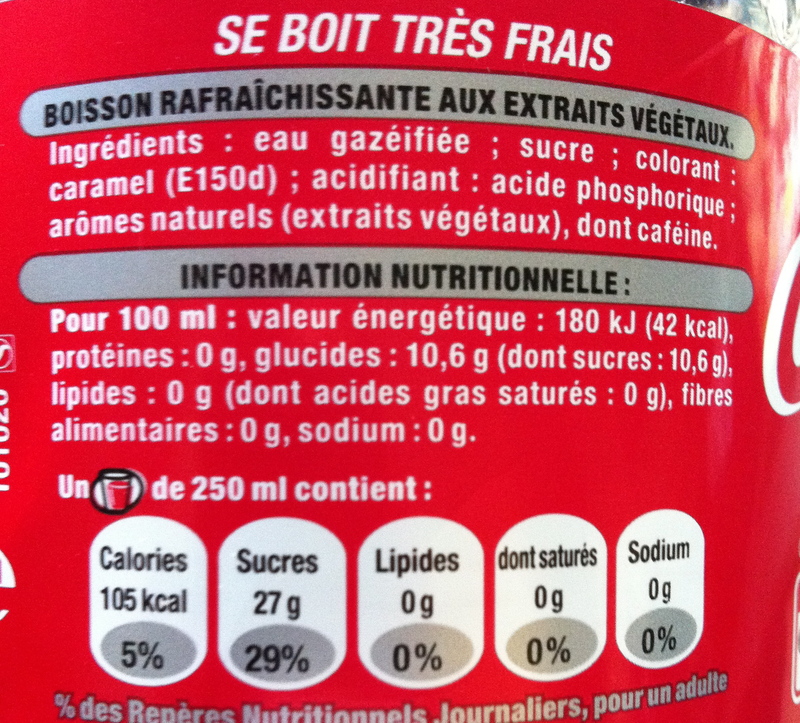 It raises the question, then, how come the French still enjoy real Coke “Classic” and we Americans get the HFCS version? As it turns out, Americans started using HFCS as a sweetener in the early 80s because of government subsidies to corn producers, an import tariff on foreign sugar, and production quotas on domestic sugar. All of that led to artificially high prices for sugar and relatively lower prices for HFCS. In contrast, the European Union imposes a production quota on HFCS instead of on sugar, which leads to artificially high prices on HFCS and relatively lower prices for sugar. So, when you drink an American Coke, picture endless cornfields in Iowa; when you drink a French Coca, picture beet fields in Germany and sugar cane plantations in Guadeloupe. Okay, so it’s a Belgian ad, but it’s chock full of great Coca-Cola marketing in French. Interestingly, you can find sugar-sweetened Coca-Cola in the United States. In many Latino neighborhoods, stores carry sugar-sweetened Coca-Cola imported from Mexico, and in the springtime, you can easily find “Passover Coke” in the supermarkets of cities with large Jewish communities. (Since corn is a grain that “rises,” it’s off limits during the Passover holiday.) Personally, I think Coca-Cola should follow Pepsi’s lead: if Pepsi can produce “Throwback Pepsi” made with real sugar, why can’t Coke start producing “Old School Coke”? There’s no good reason the rest of the world should have a monopoly on the Real Thing! ← What is it with the French and Peanut Butter? Well, I wouldn’t go so far as to say that the French have made Coke better. After all, it’s the original American recipe that’s still being produced in France. But, yes, the French have a way of treating food well that I certainly hope doesn’t change. Efficiency v. quality is not an easy battle to fight, but let’s hope the French restent aux armes ! This was an excellent post on Coke! Keep the food writings coming! I hate HFCS! Am constantly reading labels in the market (until now, when I can’t be bothered) – as it takes me long enough to figure out the MAIN label on any item I’m buying (ha ha). Haven’t been able to comment lately because our (jerry rigged – probably bootlegged) apartment WiFi went ka-poot so – finally got ourselves a “proper stick” – yeah!!! PS – that zero stuff – you know- is probably worse than just drinking the REAL thing. All in moderation, ofcourse. My metabolism really can’t take that many calories either! I actually grew up South Carolina, not far from Atlanta, and I have NEVER been to the Coca-Cola museum! Hmmm. maybe that’s where I should take my French hubbie the next time we’re in the States! You are SO right … give me pure sugar over corn syrup anytime! I have heard the name! Think we drove through it on the way to Savannah? My husband taught at Clemson for 1 year, and now at Tri-County Tech but wants to pursue a PhD. Go Tigers! Charleston is enchanting, I love to visit there too when the opportunity presents itself, and we always take out foreign visitors there… a must-see of SC! I’ll check out the post… Christmas is still the best in the Alsace, if you ever get to take the TGV there in December to visit the Christmas markets! Go Tigers! (Even after the abysmal end to last season!) So, that means you are in SC now? Wow, very cool. Are you from Alsace originally? I have a sister-in-law and a brother-in-law just outside of Metz, so I’ve been to Lorraine, but not yet Alsace. Strasbourg is definitely on my short list of domestic destinations, though. Maybe for Christmas this year, since it will be my turn to have French Christmas again … and I’ll need to write about French Christmas markets for the blog! It would be a research trip! Well, I’m off to bed. It’s late here. But this has been so much fun. I hope you’ll keep following the blog. I’ll definitely keep an eye on yours! Yep, in Pickens, SC now on top of a mountain (see airbnb listing on my blog). I am from Alsace, more precisely near Colmar. Grew up there, studied there… Well I have a bias, but Alsace is the prettier of the Alsace-Lorraine regions 😉 Metz and Nancy are nice though! Been there many times. Oh yeah, you would love the Christkindlmarik as a research trip! Indeed, so glad we connected… will also keep following. Bonne nuit à Paris! I love this post! I have always felt French Coke was SO much better than its syrupy American counterpart. I actually think it’s better than the American version even when the American version is made with sugar. Something in the French version, like with everything else, is just better! Well, not EVERYTHING else … but a lot of things. Glad you liked the post. Stay tuned! Pingback: 10 Things That Are Always Better When Travelling - HotelsFlash - All About Hotel News! - HotelsFlash – All About Hotel News!